Candice Olson, interior designer and host of HGTV shows Candice Tells All and Divine Design, really needs no introduction. Her shows were broadcast in 75 countries around the world, and millions came to know and love Candice's signature style and trademark sense of humor. In her own words: “I find it's important to show the serious side of design and inspire others to create engaging homes. But another important lesson learned is to enjoy the moment and find time to have a good laugh. It is my team of talented, hardworking people that manage to keep me—and each other—laughing." My first design job started out as a part-time position in my third year of university. I was scouted and hired at our faculty’s year-end show by a booming firm specializing in retail and hospitality design around the world. I worked crazy hours while in school and continued on with this firm several years after graduation. I was overworked and underpaid but given remarkable opportunities and responsibilities. It was truly a case of baptism-by-fire but invaluable work experience. However, I always like to talk about my first first job that I had when I was 14 working at Bob’s: the city’s most popular drive-in. Bob’s: Home of Bob’s Bigger Better Beef Broiled Burgers. It was a mouthful, literally! Of course this had nothing to do with design but I learned a ton about scheduling and organizing and how to deliver customer service under pressure. Great skills that helped me many, many years down the road when I started my own design business! I however, haven’t eaten a burger since! What was your first passion? I always loved to draw. I’m an only kid and I grew up quite modestly. I would spend countless hours creating elaborate imaginary worlds and characters on paper that would take me places I could only have dreamed of going back then. The more I drew the more magical the experience! What drew you to the design world? I love both art and science and the business of design and building combines both. Do you have a design mentor? If yes, can you tell us a bit about him/her? I also have the utmost respect for Philippe Starck’s long and illustrious career. He’s been relevant since the early 80’s when he first gained notoriety as François Mitterrand’s designer. He’s a major force in so many sectors of design: interior, industrial and architectural. I also really love his eclectic, whimsical, tongue-in-cheek approach to design. Who/what inspired your textile designs? Can you tell us a bit about how your textile collections came to be? When it comes to creating textile palettes, patterns and textures there’s been no greater inspiration to me than Mother Nature, arguably the greatest architect, designer and artist of all time! Sea, sky, stone, weather, skins: the beauty found in nature provides me with endless inspiration and translates so effortlessly and well, naturally… into the home. Other sources of inspiration are rooted in classic design. I believe there are solid design principles (scale, proportion, etc) that make something beautiful enough to stand the test of time and that should be honored. You’ll see this in my textile collection with reference to familiar classic patterns like damasks, paisleys and architectural grillwork that are interpreted in a contemporary way. This approach injects an all important, fresh yet familiar attitude to the collection and is important for creating looks that are timeless yet very today. I’m also heavily influenced by light and it’s reaction to surfaces and materials. You’ll see this reflected, literally in many of my fabrics! 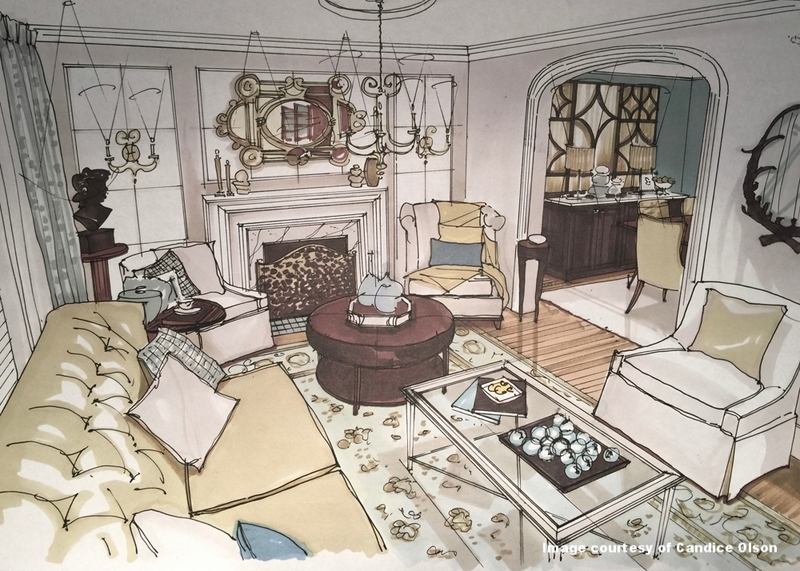 How can the Calico customer create a touch of Divine Design in their own homes? I am particularly proud of my latest fabric collection for Kravet! It features my all-time favorite, signature design ingredients: calming, nature-inspired palettes, beg-to-be-touched textures and unexpected contemporary takes on classic patterns. Everything that, as a designer, I personally call on to create spaces that are on-trend yet timeless. They also reflect a feeling of carefree, everyday elegance and livable luxury. Until now the collection has been available through designers and architects where is has enjoyed tremendous success. Unprecedented customer interest has resulted in an exciting new venture that sees Kravet partnering with Calico to provide access to the fabrics either by-the-yard or custom made into window treatments, blinds, shades, bedding, furniture, pillows, cushions, slipcovers or for re-upholstery. Calico is now the go-to resource for those customers looking to get my signature look of livable luxury in their own homes! Spend every dollar of your client’s money as if it were your own. What is your favorite rule to break? The rule I love to break revolved around using only light colors in small spaces. Color doesn’t make a space seem smaller it’s contrast of color. In smaller spaces I love to use a dark, low contrast, monochromatic color scheme to create a cozy intimate feeling. With low-level lighting from table lamps and sconces, the walls just seem to disappear. LED lighting as the main source of lighting in a room is my biggest pet peeve. It’s fantastic for decorative lighting accents and details but I’m not a fan of the quality and color of the light when used as the main source of lighting. What is your go-to paint color? It’s no secret that I love smokey, muted grays and blues. These cooler tones are a natural complement that tempers the warmth of wood floors and furnishings. Benjamin Moore’s Horizon Gray, Thundercloud Gray and Pike’s Peak Gray are three of my faves. What color do you despise? My inspiration comes from experiences like travel, theater, music and nature. It sounds simple but I try to experience as much as I can and be acutely aware and observant during the process. My husband says that I am always visually dissecting but I like to think it more as digesting! With York Wallcoverings in York, Pennsylvania, we are finalizing the photography on the 17th Candice Olson book while developing new patterns and colors for the 18th book of wall coverings. Prototypes are being developed for our new line of lighting with Surya. Sketches, CADs and prototypes are being developed for our existing wall art, area carpet and outdoor furniture collections and we will soon be announcing an extensive new furniture partnership… busy, busy, busy!